PHILADELPHIA (AP) -No thrilling comeback needed for Toronto and Pavel Kubina. Kubina finished Philadelphia in regulation and has the eighth seed within reach for the Maple Leafs. Kubina scored his second-straight game-winning goal to lift the Toronto Maple Leafs to their second win against Philadelphia in two nights, beating the Flyers, 3-2 on Wednesday. "Hopefully it will be the start of a slide for them and the beginning of a roll for us," defenseman Ian White said. "So with a little help we'll pass them." Kubina scored the winner in overtime on Tuesday when the Leafs rallied from a three-goal deficit to beat the Flyers 4-3. This time, Kubina got Philly early in the third period. 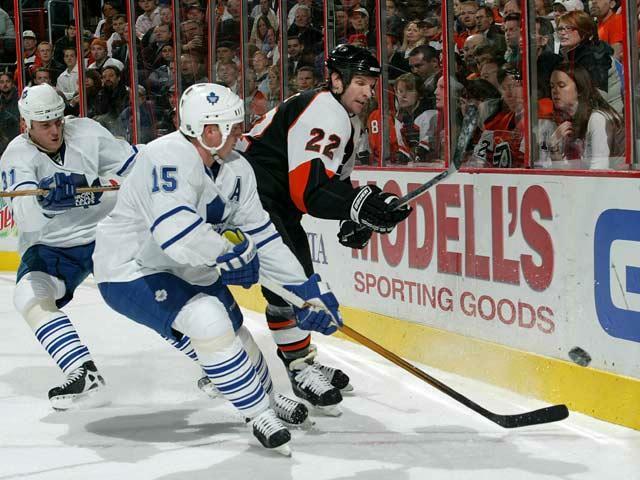 Playing without Mats Sundin for the last two periods, the Maple Leafs moved within five points of the Flyers for the eighth and final playoff spot in the Eastern Conference. The Maple Leafs lost Sundin in the first period with a strained groin muscle. Sundin, who leads the team with 77 points, had scored a point in nine straight games and helped lead the Maple Leafs on their current 9-3-1 streak that has them making a late postseason push. Sundin is day to day and should be able to play Saturday against Buffalo. "He's the leader of our club, there's no question, but everyone stepped up when he was out and got the job done," White said. White and Alexei Ponikarovsky also scored goals for Toronto. Vesa Toskala made 18 saves. The Flyers again wasted their home-ice advantage. While the fans haven't deserted them, the Flyers have given them little reason to cheer this season. They dropped to 16-14-6 at home and the diehards booed them off the ice in the final minute. Buffalo, Washington and Florida are also chasing Philadelphia and are in the hunt for that final playoff spot. "We're just making this group more crowded all the time," Flyers coach John Stevens said. "It's time for us to start taking care of ourselves." Jeff Carter and Mike Knuble scored for the Flyers. The Flyers bemoaned their blown shot at moving up the East standings and passing Boston and maybe the Rangers if they could have won at Toronto and earned at least a point at home. "You're going to run out of opportunities at some point," Knuble said. "We still can control where we go." Martin Biron, who made 51 saves against Toronto on Tuesday, had 28 in this one. Biron, however, was helpless to stop Kubina's power-play slapper 1:09 into the third for a 3-2 lead. Kubina also scored a goal in regulation a night earlier in the third as part of Toronto's stunning comeback. "We just have to get him out there more," coach Paul Maurice said. "It's a confidence issue and he's feeling good with that puck right now. He's getting it hard off his stick and he's played well." They carried that momentum over into this one, with White's fourth goal of the season barely 4 minutes into the game giving them a 1-0 lead. Carter tied the score 3 minutes later with his 27th goal when he beat Toskala through his legs. Ponikarovsky took a nice pass across the crease from Dominic Moore and flipped the puck past Biron for a 2-1 lead. Knuble tied the score midway through the second, using a two-man advantage to score his 26th goal. Knuble scored Philadelphia's 78th power-play goal overall and 42nd at home. Notes: NASCAR driver Kevin Harvick, in third place in the Sprint Cup standings, attended his first NHL game. He met Carter before the game and got his jersey. "I'm probably the most uneducated hockey guy in the building," Harvick said. "I wouldn't mind a fight or two along the way." ... Flyers F Joffrey Lupul returned to the lineup after missing a month with a sprained ankle. ... Toskala made his 23rd straight start. ... Flyers D Jaroslav Modry recorded his 200th career assist. ... Sundin had 16 points in his nine-game streak.